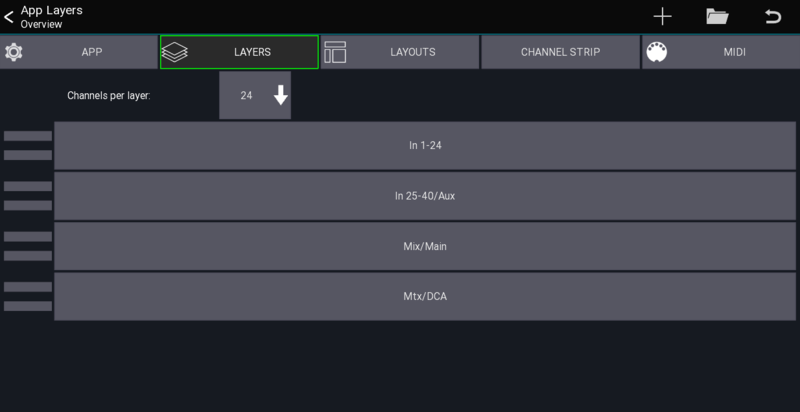 A layer defines what channels should be shown in the mixer. You can creates an unlimited number of layers and each layer can contain up to 32 channels in a user definable order. The selected number of channels will be shown. If a layer has less channels, placeholders will be shown. If a layer has more channels assigned they will be hidden. The list in the bottom of the screenshot shows all layers. By pressing the + menu item you can add a new layer to the list. It will be appended to the bottom. A layer can be edited by selecting Edit from the context menu or by Press and hold a layer button directly from the mixer view. Use the + button to add more channels / IDCAs to the layer.